Guitariste Country US né Philip Roland Baugh le 13 Décembre 1936 à Marysville (Californie). 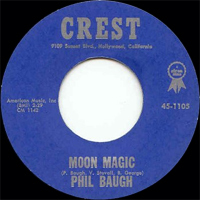 Phil Baugh est décédé le 4 Novembre 1990. 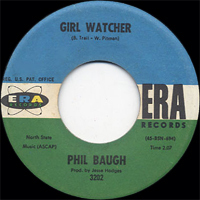 Phil Baugh was one of the best session guitarists in Nashville during the 1970s and '80s. Born and raised in Northern California, he began playing guitar and performing in churches as a child, which led to band and nightclub gigs. He got his first big break playing with Ray Price, who helped him get a recording contract with Longhorn Records in Dallas. 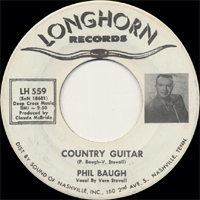 In 1964 Baugh and Vern Stovall recorded the album Country Guitar, which contained two major hits, "Country Guitar" and "One Man Band." In 1965 he was named Best Guitarist by the ACM, Outstanding Instrumentalist of the Year by Billboard, and Instrumentalist of the Year by Cashbox. 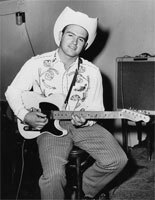 Baugh rejoined the Ray Price band as a lead guitarist in 1969. He moved to Dallas two years later and became a prominent studio musician for commercial jingles and album projects. 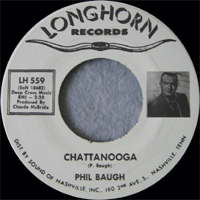 Baugh moved to Nashville in 1975 and there became one of the hottest session players in town. His unique sound stemmed from his invention of the "Phil Baugh Pedal," comprised of six pedals that bent the strings of an electric guitar to produce sounds similar to that of a steel pedal guitar. Baugh formed the Superpickers in 1980, which included steel guitarist Buddy Emmons, drummer Buddy Harmon, bassist Henry Stryzlecki, pianist Willie Rainsford, and percussion/harmonica player Terry McMillian. 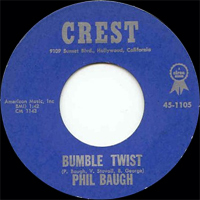 During the early '80s, Baugh also embarked on a successful producing career. He suffered a coronary in 1985, but continued working on the Nashville Network's Church Street Station. However, he never fully regained his health and died in 1990 at age 53.